I’m always a little over-whelmed by the multitude of grains, rices and dried pulses at our local Turkish grocer. An aisle piled high with bags of different sizes and shapes seems to stretch as far as the eye can see. It’s like looking into the store house of Suleiman the Magnificant’s army. All these exciting things to play with and what do I do? I reach for the cous cous or red lentils every time. Until about a year ago, in a fit of bravery, I branched out and grabbed a bag of coarse bulgar wheat. I’ve always enjoyed the creamy toothsome grains in restaurants but had assumed it would be a faff to cook. How wrong I was. It’s simplicity itself. Imagine cooking cous cous, bulgar wheat is easier. Put in a pan, add boiling water, cover and leave for twenty minutes. That’s it. I was gobsmacked. Where was the over night soaking and three hour cooking times? All the baking soda, bay leaves and bumph that seems to be required for so many dried things? The key here is to make a dish that plays off the gentle, creamy and nutty texture and taste of the wheat. You need ingredients that will use these qualities both as a launching pad, and an anchor to keep them grounded. Think fresh and zingy, or caramelised and rich, aromatic and chili heat both work as well. 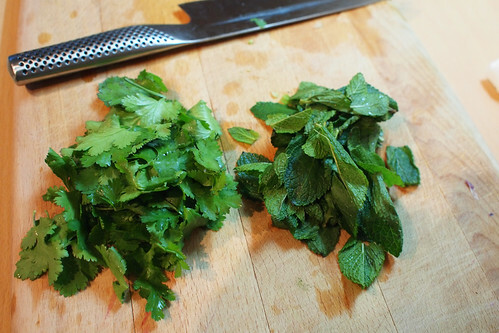 Fresh herbs are particularly good and Kisir, a citrussy herb and bulgar salad is a staple at most Turkish restaurants. As is the similar Tabbouleh in Lebanese and Arabic joints. 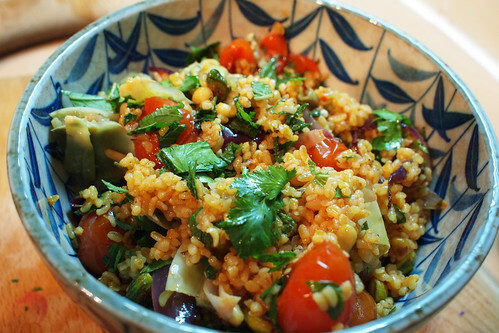 Although in most cases in the UK, they add way too much bulgar, it’s meant to be mostly herbs. Here, I have gone for something aromatically spicy and warming. A mix of influences from North Africa and the Levant. The result is something that looks very attractive, tastes even better and can be eaten warm or cold. It’s particularly good for lunch the next day. This is based on, and inspired by, a recipe in Hugh Fearnley Whittingstall’s River Cottage Every Day book. I have tweaked the dressing and accompanying vegetables to make it a little richer and warmer. But you can add pretty much what you want. Fresh crunchy vegetables like cucumber, pepper and spring onions, or softer sweeter ones like roast sweet potato, chickpeas and grilled aubergine would all work well. Also, to make it more meaty you could use chicken stock. Put the oven onto 180oC. Put the cherry tomatoes, the onion wedges, extra virgin olive oil, garlic cloves and oregano into an oven proof dish and toss well. When the oven is hot, put the dish in and roast for 30-40 minutes or so. Put the bulgar wheat in a pan and pour in the boiling water. Cover and leave for 20 minutes. 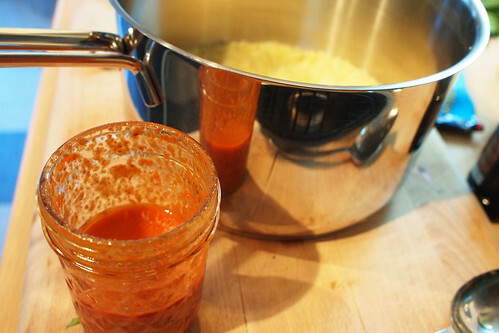 Put all the dressing ingredients in a jar, put the lid on and shake vigorously until everything is combined. After the 20 minutes is up, stir in the dressing and leave the bulgar wheat to cool down completely. When the tomatoes and onion are done, tip the dish into the bulgar wheat. Add the nuts and the fresh herbs, stir well and serve. I do exactly the same as you – time to be a bit more adventurous and turn to the bulgar! What a gorgeous, colourful salad! @Oliver – thanks, and it is a great staple isn’t it? @catty – it does a bit, bulgar wheat tastes just as good though – promise! Sorry if I missed it but a print recipe button would be great. @Lisa – I am definitely working on it – this design is very much an evolving one, so this should appear at some point. Once I have worked out how best to make it work. @Jo – I’ve found molasses (or at least black treacle, which is pretty much the same thing) in Sainsbury’s and Waitrose before. Otherwise use the dark brown sugar, it’s a little sweeter but has a similar effect. Cool! That’s great that you’re using the recipe for a good cause. @Emma – I’m so glad it’s both useful and tasty for you! I had never thought about bulgar in that way before. Have you tried quinoa yet? It’s a fantastic grain and so versatile. If you are on the lookout for more interesting grain recipes, it’s worth checking out Yottam Ottolengi’s Guardian column online. He does a lot of bulgar, freekeh and other grains.